Brass Insert Fixings various types and sizes. VP Racing Fuel Jug Replacement Screw Cap or Filler Hose. Aftermarket Seadoo 785 800 Powervalve gasket. Also fits aftermarket power valves (e.g. DASA). A2 Stainless bolt set and washers for Front cover. Aftermarket Yamaha V Force 3 Reed Gasket. For use in Flywheel cover, used with ATP Total Loss systems also. OEM Yamaha Bronze bush for use in either the front cover Bendix or crank case Starter Motor. Header Pipe Gasket for use on Factory "B" Pipe plus others. Aftermarket Yamaha 701 & 760 Twin Carb Reed Spacer Gasket. Genuine OEM Cylinder Base Gasket Yamaha. M8 A2 Stainless bolt kit for your Cylinder Head including stainless washers, socket head for ease of install. 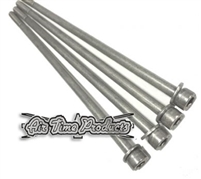 Pump Bolt set 4 pack Yamaha SJ stainless cap head with washers may fit other models using same pump. Genuine OEM Bendix weight spring. Genuine OEM Bendix weight retainer/holder. Aftermarket Front / Flywheel Cover Gasket.